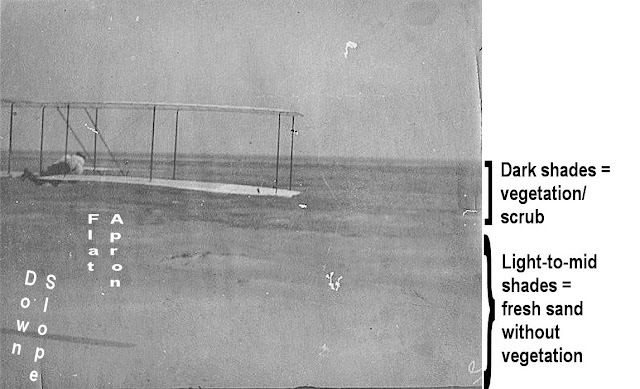 A century ago, the Wright Brothers were caught out in exactly the same manner. At the risk of boring the reader with a statement of the patently obvious, it should be noted that the glider — being a glider — is taking off down-hill. The photographer is standing on the same sand dune, a few feet lower down from the take-off point, and looking down to where the glider is intending to fly. Taking into account the Kill Devil Hills geography, the absence of another major sand dune in the middle distance indicates that glider and camera are pointing slightly east of north, where the terrain in uninterrupted until the settlement of Kitty Hawk, three miles distant. 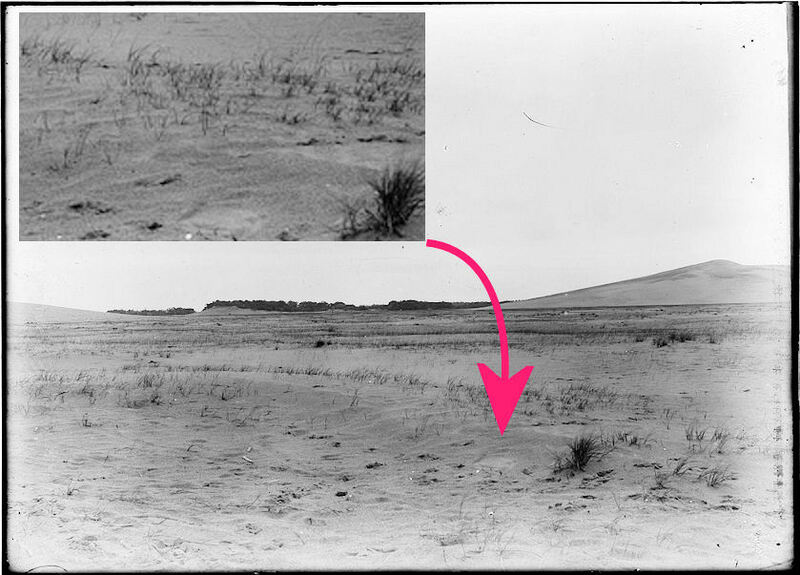 Before the dunes were stabilized during construction of the Wright memorial park, the prevailing northerly wind removed sand from the northern faces of the Kill Devil Hills and deposited it in the lee of the south faces at the rate of some 20 feet per year. This process meant there was no chance for vegetation to grow on the north faces. Sand previously inside the dune was exposed to the wind for only a few days before it was on the move to the rear. Lower down, beyond the base of the dune, the flattish land provided just enough shelter for scrubby growth. Examination of the land in Chanute’s picture shows the raw, sand face of the dune in light color, close to the camera and slightly discolored by disturbed or damp sand; and, in the middle distance, a change to a darker area, marking the start of scrub, where the land has levelled out. Around the base of the dune is a small apron of flat sand where only the first few grasses have had time to colonize since the dune rolled southwards. No tufts of grass are visible on the sloping ground near the camera. 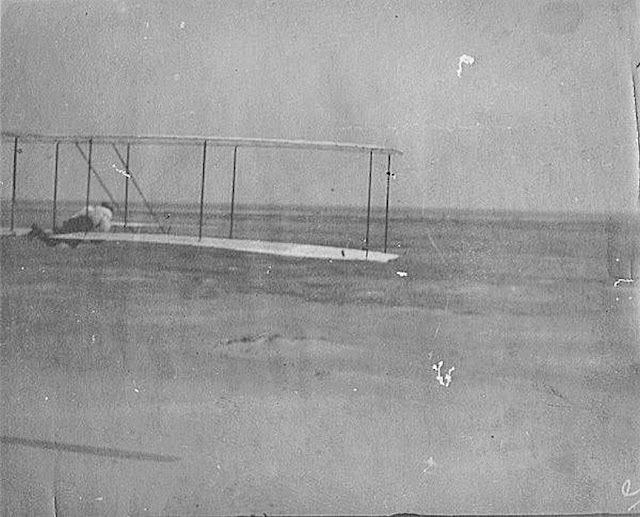 A few other pictures taken at Kitty Hawk, and reproduced in reference books, have been over-exposed and show darker shades throughout. The principle holds, though: vegetation shows darker than pure sand. Does the arrangement of the above picture look familiar? 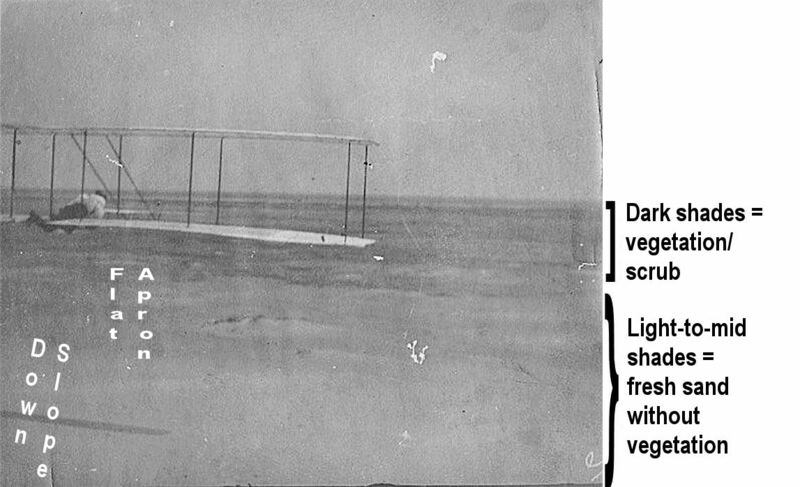 We have already drawn attention to serious anomalies in the well-known “First Flight” photograph which cast considerable doubt on the claim that this was a take-off from the flat — thereby voiding the first-flight claim entirely. The findings are described in great detail in previous posts but, in summary, they are: (1) perspective within the photograph shows the start end of the launch rail to be higher than the take-off end; (2) ground is visible well below camera height, on which is a scrub-lined ridge leading to even lower (base level) ground; (3) two helpers both agree they carried the Flyer up a hill for launching; and (4) a written statement by the Brothers’ father, less than a week after the event, states that the launch rail began with a downhill slope to assist the aircraft in gathering speed. Our previous analysis mentioned ground shades in passing, but the availability of a photograph by Chanute, undeniably showing the surface coloring change when viewed from part-way up a dune, makes the conclusion positively unavoidable: The famous “First Flight” picture shows (5) the airplane taking-off downhill from bare sand on the side of a dune and making a power-assisted glide towards scrub land at a lower level. 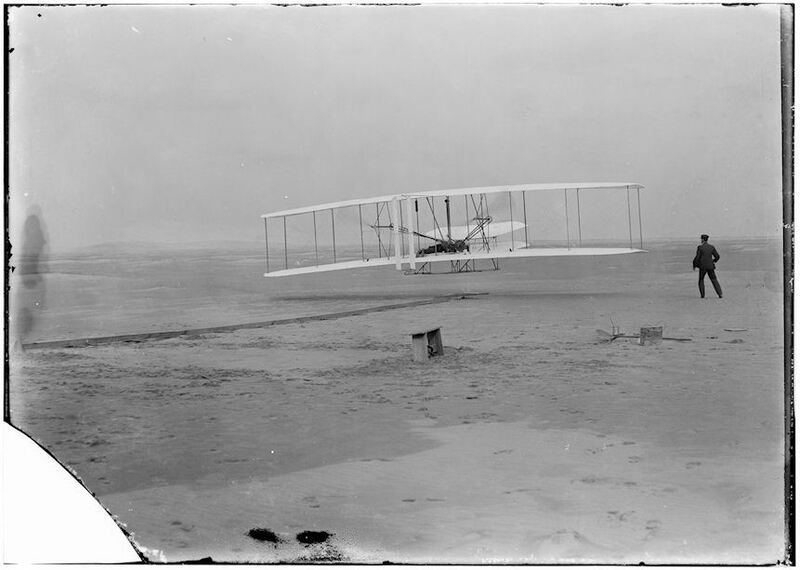 Had the Wrights “started from level” as they claimed, the ground under, or in the immediate vicinity of, the launch track would probably have looked like this, as shown in their photograph catalogued as 00674 by the Library of Congress. Small clearings of flat sand are visible, but the operative word is “small”. Patently, however, the land all around the launch track in the “First Flight” picture is completely devoid of scrub, and so strongly suggestive of sand starkly exposed to the prevailing wind — downward sloping sand, in other words, like in Chanute’s picture. There is not a blade of grass to be discerned anywhere in the “First Flight” photograph, yet the end-of-fourth-flight photograph (Library of Congress 00514, reproduced below) is much like the above (tufts of scrub marked red). The Flyer took-off from an area devoid of vegetation and landed in an area liberally strewn with clumps of grasses. Yet the Wright Brothers tell us that the surface they lifted-off from was the same surface — at the same height above sea level —on which they alighted. Their own photographs prove that the two spots were very different. This post is another essay from one of our highly respected and much appreciated contributors to our blog: "Truth in Aviation History." As stated previously, the purpose of these articles is to address differences between information presented in the "Perspective" compilation and that in this author's book The WRight Story. Chapters III and IV of that book contain detailed discussions of the development and testing of the Wrights’ early aircraft based exclusively on an experienced aeronautical design engineer’s interpretation of the Wright brothers' own words and records. The discussion points in these articles have been derived mostly from information in those chapters of The WRight Story. The first element of the Wrights’ propulsion system addressed in this section of the "Perspective" is the propellers. On page 80 the Wrights’ design procedure is referred to as a theory with formulas. There were elements of theory and a number of formulas to relate some of the parameters involved. But as explained in the first article of this series, since there are many more unknowns than knowns in propeller design, it is not a closed procedure. Rather it is what could mathematically be termed an under constrained iteration problem. To briefly recap, typically one starts with a known number of engines, their rpm and torque output, clearance restrictions, and perhaps a speed requirement. Factors to be determined include number of blades, blade rpm, blade cross sections, angles of attack and twist, blade width or chord, taper, and resultant thrust. One also has to account for the acceleration of incoming air ahead of the propeller which of course varies with the speed of the aircraft resulting from the thrust previously calculated. Typically one must pick certain parameters, calculate the others, and iterate chosen parameters to a satisfactory solution. Of course modern computer design programs with their wealth of stored data are a big help in this process. On page 81 it is claimed that early Wright propellers had problems with twisting and so “in 1905…a pie-shaped portion of the leading edge was removed resulting in a relatively constant blade width for 30 percent of the distance from the tip to the center” of the propeller. These were known as the "clipped or "bent end" props. Twisting may have been a factor, but reducing the chord near the tips of the props no doubt unloaded the tips and improved efficiency. Fort Meyer, VA,, September, 1908, The Wright Flyer with "bent end propellers." 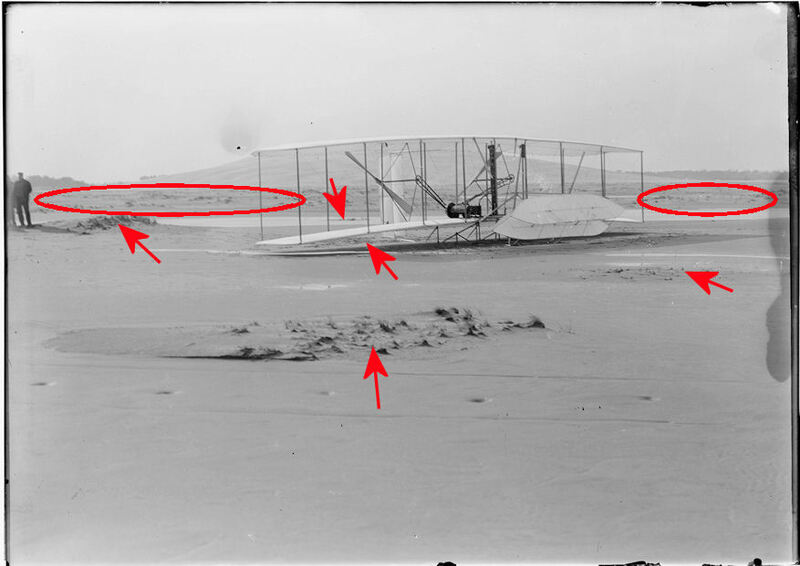 In fact, the biggest failing of the Wrights’ original props was that their chord kept increasing all the way to the tips. This has a similar effect to that of reversing taper on a wing. The tip losses, and thus the induced drag, are excessive. That’s why, since fairly early aviation, propellers have had their maximum chord somewhere before 50 percent of the blade length and taper thereafter. It is also why some historians' claims of fantastic efficiencies of Wright propellers (well in excess of the 66% claimed by the Wrights) are erroneous. The article does not address the torque transmission system adequately since this was the major source of problems in 1903. The chains used were lengths of engine timing chain and thus were much more robust than the bicycle chains assumed by many historians. The engine ran very roughly, particularly when cold, delivering jerky torque. So whipping and interference would still have been problems if the chains had not been enclosed in pipes. Although the chains were sufficiently robust, the original sprockets, tubular propeller shafts, and bonding materials were not. This created problems until solid steel shafts were made and proper bonding material was used to fasten the sprockets to them. Page 82 repeats the universal claim that “In view of the state of the art at the time, no suitable engines were available.” This is not really true either. Engines of twice this power-to-weight capability were in existence at that time. More likely, something in their requirements was interpreted by the manufacturers approached as demanding a specialized engine and the Wrights were not willing to cover such a cost. Cost was certainly a factor as they stated that they feared it was possible that crashes would destroy at least one of their engines. Pages 82 to 86 contain a very comprehensive description of the design and construction of the 1903 four cylinder engine, the first built by the Wrights. 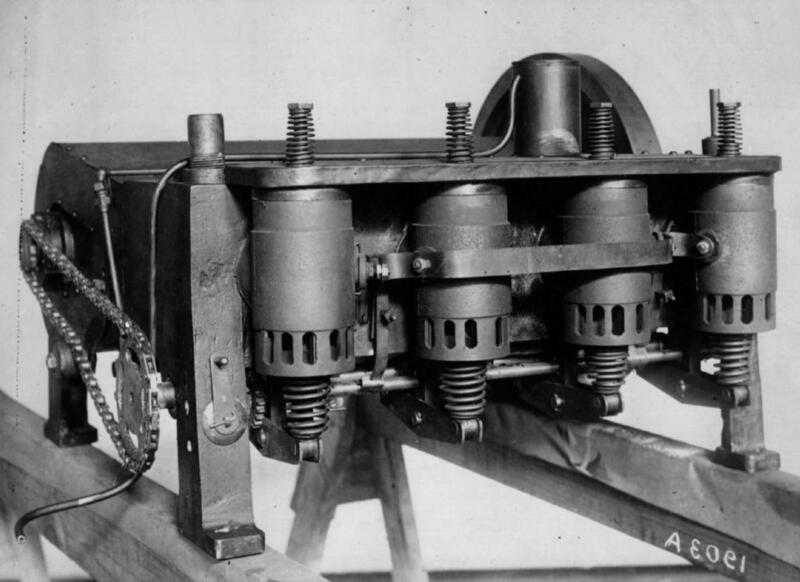 The reader can’t help but be impressed with the amount of detail that had to be addressed and the number of problems that had to be solved to create this first Wright engine. Although the crankshaft had no balance weighting, low rpm helped limit engine roughness. On Pages 86 to 91 subsequent four and six cylinder engines are examined. Unfortunately their V-8 engine was destroyed in a crash and almost no information on its design remains. 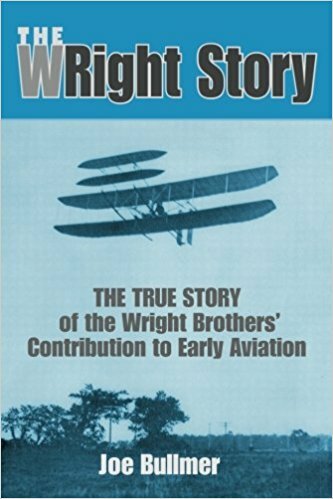 Also on page 91 the author mentions that lubrication and cooling problems arose with the Wright engines but quite correctly opines that it was in solving these problems that the Wrights showed ingenuity, not having any education or training in engine design. Finally on pages 92 to 94 balance and volumetric efficiency of the 1903 engine are addressed. Not having an original or replica of the engine, efficiencies were calculated with corrections applied to data from a modern Pratt & Whitney engine. 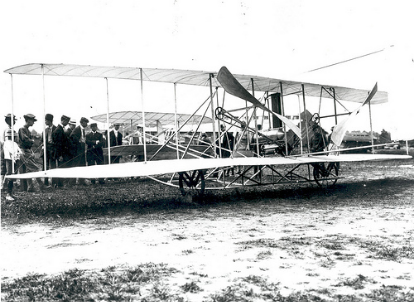 This indicated that the thermal efficiency of the Wrights' original engine appeared to have been around 25% and the volumetric efficiency about 40%. That volumetric efficiency is over half that of typical internal combustion engines at the time this "Perspective" article was written nearly a century later. However, the thermal efficiency is directly comparable to engines developed at the time the "Perspective" article was written. In fact in 2014, Toyota claimed to have developed an engine with a thermal efficiency of 38% which, they claim, was the highest of any mass produced internal combustion engine, most having thermal efficiencies of around 20%. So 25% efficiency for their Wright engine over a century earlier seems quite high, particularly considering that with no carburetor, no choke, and a rich fuel to air mixture, some of the fuel must have passed through the engine unburned. Considering all this, the quoted efficiencies seem quite high for an engine designed and built in 1903 by beginners. On page 98 the author mentions how the universal joints connecting the vertical wooden struts to the wing spars enable wing warping. This is true and may well be the original reason the Wrights designed the joints that way. However these joints turned out to be the critical structural design feature enabling the Wrights success as will be explained at the end of this discussion. is presented that states “We originally put the elevators in front at a negative angle to produce a system of inherent stability….We found it produced inherent instability.” This unassailable quote directly contradicts information presented on page 22 in the second section of the "Perspective" and also that on page 52 in the third section. 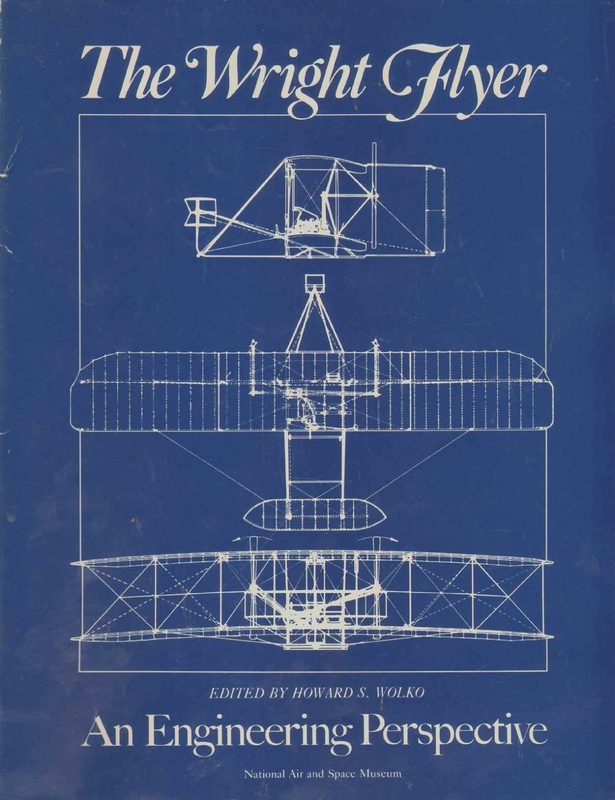 On the next page the Wrights’ original design specifications for their 1903 plane are quoted as calling for eight horsepower to drive a 625 pound gross weight vehicle at a cruise speed of 23 miles per hour. It is a good thing these specifications were underestimated, otherwise, considering the ambient winds at Kitty Hawk, the vehicle would likely have been destroyed before its first takeoff. As it turned out it was destroyed, anyway, by the winds later that day, while sitting unattended. Also on page 99 appears the statement that “when wind tunnel tests showed the Lilienthal coefficients to be essentially free from error…..the Wrights…..calculated the more nearly correct [Smeaton’s] coefficient of 0.0033”. Although this statement also contradicts those appearing in previous sections of the "Perspective", it is true that the Wright’s wind tunnel verified the accuracy of Lilienthal’s lift coefficients. But before they had built their wind tunnel, Wilbur stated in an October 6, 1901 letter to Octave Chanute that they had adopted Langley’s value of 0.0033 for Smeaton’s coefficient because it produced better correlation with their 1901 glider data. Their wind tunnel tests commenced almost two months later in late November. Pages 98 through 105 of the "Perspective" present analyses of the designs and loads of the wing ribs, spars, struts, and wires for the 1903 Flyer. While this discussion is comprehensive, it is freely admitted that there are many gaps in what remains of the Wrights’ structural calculations and designs, and much of the analysis shown in the Loads section of his report is not necessarily what the Wrights may have used. This discussion concludes that although the design was marginal in some respects, it was adequate and actually impressive considering the Wright’s background. Unfortunately this section of the "Perspective" on structures does not mention the most important advantage resulting from the structural design of Wright gliders and early Flyers. The method of attaching the wooden struts to the wing spars is mentioned early on and the resulting compression loads in the struts are discussed. Also mentioned is that the wires connecting the centers of the struts can be considered to cut bending moments in half thereby reducing the chance of column buckling. However, the major advantage of the strut and wire arrangement is not mentioned. The attachments of the struts to the spars are effectively flexible universal joints. Only compression and tension could be transferred through the joints. Bending could not. The crossed guy wires were in tension and thus pre-loaded the struts in mild compression. Photos of crashed or hard landings indicate that the easily replaced wires were the first things to fail, usually leaving the wooden struts intact. This was aided by the wires connecting the centers of the struts causing adjacent struts to share any column bending loads resulting from excessive compression. Consequently the vehicles could survive hard landings and moderate crash loads with only minor repairs to the biplane structure, often just replacing some wires or “sistering” a split skid with a spruce stick and some twine. Not only that, but the universal joints were achieved with simple metal hooks and loops which were impervious to sand or dirt. This concludes the fourth and final article in the four part series discussing The Wright Flyer, An Engineering Perspective. It is hoped these articles will be treated in the spirit intended, merely to make the historical record of the Wrights’ work as accurate as possible. Further detail on the points made in these articles, as well as references to sources, can be found in the author’s book The WRight Story. Joe Bullmer, above, has a Master's degree plus advanced studies in Aeronautical Engineering. His first contribution to the"Truth in Aviation History" series of articles is "Joe Bullmer Rebuttal to Tom Crouch in the"Huffington Post." about the claimed fourth flight picture of the Wrights in 1903. All of the pictures and most of the links in this essay were selected and added by the founding editor of "Truth in Aviation History." **Editor's note: There are no legitimate records of witnessed, unassisted take offs by the Wrights until years after the 1905 date.